Directly observe oxidation and reduction reactions with atomic-level precision to understand the complex underlying reactions of catalyst materials. The chemical reactions occurring at the surface of nanoscale catalysts can drastically alter the performance and reliability of those catalysts. With in situ microscopy, you can change environmental conditions of these reactions and directly observe the chemical, structural, and morphological changes underpinning the catalysis reaction with atom-by-atom precision. Electrochemical aging confirms migration and coalescence within a fuel cell. Migration and coalescence are key mechanisms in the degradation of fuel cells. In this experiment a solution of Pt3C0/C and .1M HClO4 is prepared within the electrochemical cell of the Poseidon Select Electrochemistry. The cell was then inserted into the electron microscope for imaging. While imaging the cell, the sample was exposed to a cyclic pattern of electrical stimuli, from -.5V to 1V. Coalescence is observed to correspond to changes in the electrical stimuli of the experiment. The Fusion™ heating and electrical biasing system is compatible with environmental electron microscopes. This real time video shows ceria (CeO2) in a reducing atmosphere of hydrogen at 1.2 Torr at 750 C. The lattice and surface reactions can be easily seen. This real time video shows two gold nanoparticles that are on the surface of larger iron oxide particles at 900 C. At this temperature the gold is very mobile, and the two particles coalesce into one larger nanoparticle. This demonstrates the stability of the Protochips Fusion™ system at high temperatures. This video is in real time and taken on a JEOL ARM200F (200 kV, Cs aberration correction) at JEOL in Akishima, Japan. 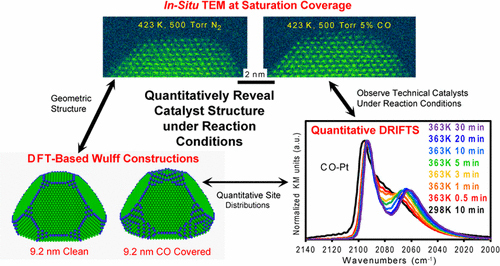 Heat catalysts to reaction conditions while observing chemical and structural changes in situ. 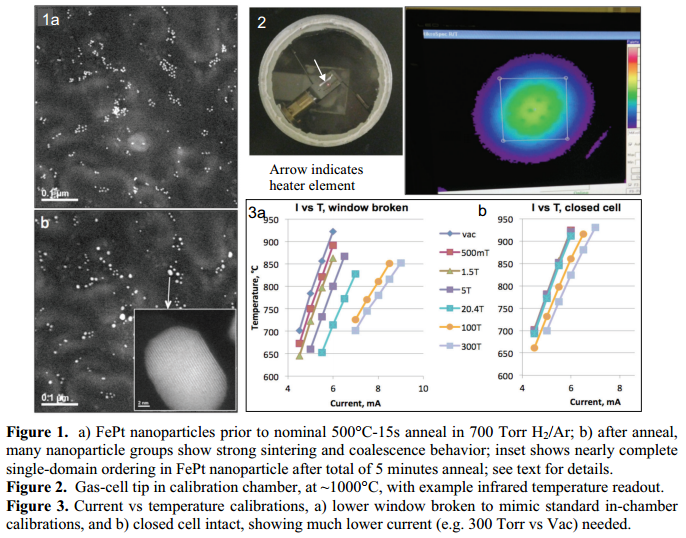 Image nanoparticle catalyst reactions occuring at high temperature and pressures while maintaining atomic resolution.